I’d like breakdown of how $2 million budget for Navajo Nation Water Rights Commission will be used. $300 a month supposedly for maintenance. I have big issue with that. Apache County paid for vehicle for Senior Citizens in my community and we brought in to have Navajo Nation Seal put on it and we were told that we needed budget $300 a month for maintenance. And wage adjustments that Council approves here is required to be paid for by certified chapters out of their budgets, which is unfair. any why are we still budgeting $1.5 million for settlement of Trust Funds, when that was settled. and why are we not giving certified chapters additional funds for wage adjustments for their employees. your COA to withhold travel from Navajo Human Rights Office was deliberated on by Budget and Finance Committee and B&F member Lorenzo Curley made motion to delete and the B&F voted to delete it. The Budget Reallocation by the Resources & Development Committee for 10 percent of Navajo Division of Community Development director salary to go into Solid Waste and there was personnel liability concern. by what authority did B&F have to overrule RDC action? under Navajo Nation Appropriation Act, B&F has that authority and the B&F also has authority to negotiate with committee chairpersons or vice chairpersons. if committees are going to be overruled by B&F, then why do committees make budget recommendations. when Naabi recommended budget, they were acting in oversight authority over those programs. 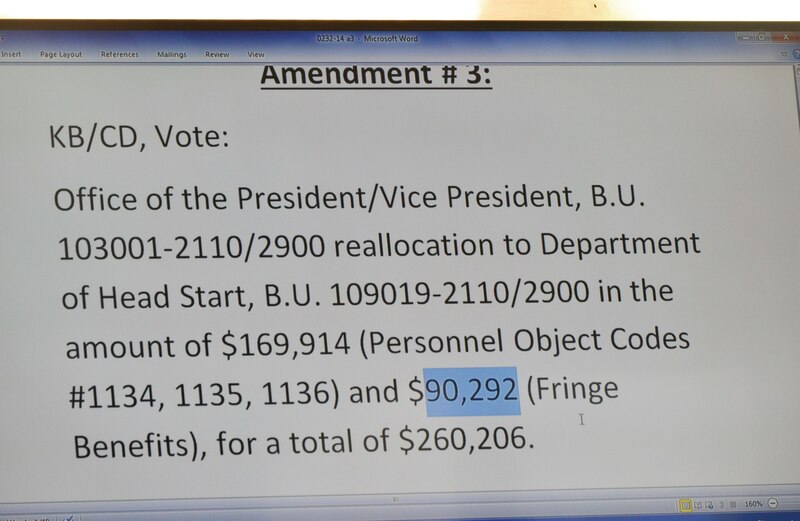 so they take budgets they approved to B&F and 12 NNC 840 A, the B&F shall consult with oversight committee before putting together final budget to Council. the provision says that after capital improvement plan is approved then 50 percent of Permanent Trust Fund is available for CIP. 50 percent of PTF income or interest earned and put into LGTF/Local Government Trust Fund. Delegate Simpson sponsored Five Year Plan for PTF and Naabik’iyati Committee tabled that plan. The trust litigation was settled and settlement approved by Council. within past three days, the US Justice Department signed and expectation is that funds transferred in 8 to 10 weeks. now we can say that there is no chance it would go back to litigation. and now there is document to have the $1.5 million moved into Uranium Litigation. as far as Water Right Funds, you need to ask for documentation from commission. regarding Headstart COA from RDC, there was issue of co-mingling federal and tribal funds. personnel lapse funds policy apply but you can’t co-mingle funds. i wasn’t trying to match dollar for dollar, i was establishing that teachers are needed. we have over 400 Head Start students that don’t have teachers. that is all of us failing especially president shelly. he has 17 staff assistants in his office and i need three teachers in Kayenta. I’m not saying match with federal funds. I’m saying to take 3 of the 17 executive office staff positions and move to Department of Head Start. We need to use some of our own money to buy those children books so they learn to read and love to read. and if we are going to do a Continuing Budget Resolution then we shud reduce travel and have people do exit report to get everything in order for next administration. And it bothers me that Controller’s office is misleading the Council about liability of standing committees and council terminating employee positions during budget development. This entry was posted in Professional Journal and tagged Head Start, Naabikiyati Committee, Navajo Nation Council by Marley Shebala. Bookmark the permalink.